Ultimately it is Wild Pines Park Ltd responsibility, as the activity provider to ensure those taking part in the activity, including those leading the activity & spectators do not come to harm. One of the key factors in ensuring safety is the provision of suitable and sufficient supervision. Such supervision, and the expertise of those supervising, will be appropriate to individual circumstances and determined by the findings of our risk assessment. What is Category E safety and Level 3 Supervision? Good question.. This has been designated by the European Ropes Course Association (ERCA). A Type E safety system is a single line safety system that you are always attached to and can only be removed by a tool. Its the safest system possible and is what we use here at Wild Pines Park. Therefore ERCA have designated that it requires just level 3 supervision. This is a level where instructors have to be in the vicinity of the participants. This is purposefully vague on ERCA's part and we have decided to exceed this recommendation. We will on the whole always be watching and following the groups as they go around. We provide verbal encouragement and often can assist people to go around the course with them if they want that help. Wild Pines Park Ltd ensures that instructors are equipped with the skills necessary to deal with any reasonably foreseeable occurrences. It is important that we identify the levels of competence instructors need to be able to ensure safety during activities. Our risk assessment detects the individual hazards. We carry out training on the ropes course and include practical incident and accident scenarios and responses. Qualifications are just one way of showing competence. It is unlikely that a single qualification will be adequate so a combination of qualifications may be necessary. Practical experience gained over the years is also considered as a way of showing competence. All courses are different, therefore site specific training and assessment of competence is undertaken for all instructors. Wild Pines Park Ltd have in place a policy for identifying the competence, experience, special needs, physical and medical condition of the participants. Once this assessment has been completed, a decision on which activities or levels of difficulty will suit the group can be made. We may need to refuse to provide an activity for a group if the group does not have the necessary competencies or skills needed to undertake the activity safely. Wild Pines Park Ltd has a policy for checking any conditions that may require a participant to receive special attention. They may need greater supervision or may even need to be excluded from the activity. This will be identified by filling in our disclaimers. 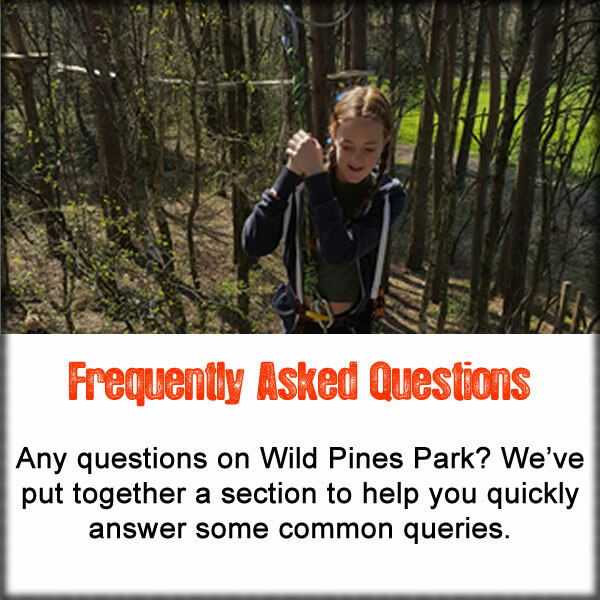 Wild Pines Park Ltd limit the number of participants in a group per instructor, taking into account group management difficulties on particular sections of the course or with particular groups. If a group is too large, two separate groups will be formed, each with an instructor, so that mutual support is available if required. The use of assistants may help group management, but the responsibilities of assistants need to match their levels of competence. Participants will be told how they can help ensure their own safety. Instructors will give a presentation on the various safety aspects of the activity, covering all the relevant information. Participants will be made aware of the dangers and, where possible, be prevented from accessing the ropes course without the supervision of an instructor. Instructors will deliver relevant instructions step-by-step at each section, rather than all in one briefing.